Thoreau went to the woods to live deliberately. We will go to the woods to dance deliberately! This unique day workshop will explore the interaction between Authentic Movement and nature. We will foster exloration by individuals while inviting in the collective experience of humans living in the natural world. 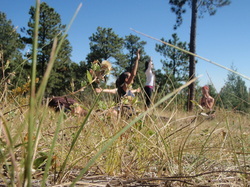 The day will include Authentic Movement practice, a contemplative hike and discussion. 303-819-4046 to register. Ask about carpool discounts! Boy are we lucky! After surviving the High Park Fire last year, Circle Rock is ready to celebrate. Join us in honoring this wonderful, wild place. 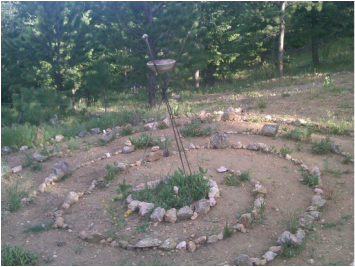 Circle Rock continues to teach us about silence, sound, movement, cycles, practicality, letting go, humbleness, magisty and rising from the ashes. This is just a day to celebrate Circle Rock and hopefully get a few new faces on the property. Come on up anytime between 12 noon and 5pm on Saturday, June 15th, 2013. Tapas and beverages available all day. Group movement meditation in the yurt at 1:30pm. Group HIke at 2:30. Walk the mandala and offer a blessing. Contact circlerockretreat@hotmail.com for directions or click on 'contact us' on this site.